When I was young, cooking on the go meant a flimsy charcoal barbecue, a tin of beans over the campfire, or making small meals on a little propane stove in the trailer. None of these are ideal solutions. Charcoal is messy and finicky for transporting; campfires are hard to control, plus they’re on the ground and camp stoves offer minimal cooking space while being almost useless for grilling meat. The solution? A portable gas grill, of course! Although many purists would rather cook over charcoal, you can still have a great barbeque experience with a gas grill. Gas fires up in seconds, there’s no dirty charcoal, and you get actual barbequing instead of just cooking on a stove outside. There are many portable gas grills on the market, but we’ve pared it down to five for this review. I’m going to go over the general advantages and disadvantages of portable gas grills, let you know what features you should be looking for, and any options that may be available. Naturally, we’ll also review a few grills in detail and see if we can pick an overall, best portable gas grill winner from the group. Let’s get started and see if we can’t help you make the big decision to buy a little grill. As a buyer, you need to be confident in your selection. The last thing you want is to flip down your tailgate, set up your grill and then end up buying sausage on a bun from a street vendor because your BBQ wasn’t up to snuff. So, before we get to the grills, we should first go over features to look for in a good portable gas grill. You might not think there’s much to consider in this category. After all, it’s probably an occasional use-only item that won’t have to work too hard, right? While that might be partially true, it’s still important to have a well-made product. If something goes wrong with your home grill, you might be able to run out to a nearby store to get the part you need, or maybe you have the tools in the garage to help you rig up a temporary solution. When you’re grilling away from home, you may not have access to parts and tools, so it’s got to work the first time, every time. Check to see parts fit tight, that there are no flimsy plastic bits, hinges are solid, the lid lines up with the firebox, etc. And since any company can have an off day and make a sub-par product, you might want to look into how hard it will be to get replacement parts. There’s little point in making a well-built grill, but using low-grade material. The lid and firebox should be thick enough to hold the heat, but thin enough to keep the barbeque from being too heavy. Cast aluminum is a good choice. Grates get the biggest workout of all the parts on any barbeque of any size, so look for quality material under the lid. A cast iron grate coated with porcelain is the best choice for heat distribution, rust resistance, and easy clean up. Remember, this is an outdoor product, and though you may store it indoors between uses, it will still get exposure to moisture. You don’t want to see exterior parts, such as hinges and latches, made from materials that are likely to rust. Granted, this is a small grill and you probably can’t be too picky in this department, but you will still want a place for your stuff, as George Carlin once put it. While you might have space on a table, or the back of a truck, to put utensils and seasonings and whatnot, it’s still super handy to have side tables. Look for a model with work surfaces that fold up or detach easily for storage. The name of the game with portable gas grills is size, but instead of, “go big or go home,” you’re more after, “go small and leave home.” Of course, you still want room to cook enough food at once to make it worth bothering with. How big, or small you go will largely depend on how many people you intend to cook for at a time, what kind of dishes you’re planning on, and how far you mean to tote your grill. Lid depth is as important as square inches of surface area if you want to cook a chicken or roast. But, if you just want to slap some burgers and dogs down for a quick bite, you could opt for a lower profile model. Think about the weight of the unit, too, and how far you’ll have to carry it. If a grill is too cumbersome to transport conveniently, you’ll soon give up taking it anywhere, and your money will be wasted. And when you’re thinking about weight, don’t forget to factor in the propane cylinders! Part of this area comes back to build quality and material selection. However, even when those factors are equal between two grills, that doesn’t mean they’ll be equal in terms of durability. If you’re the type who tends to just toss your stuff in the trunk, slam the lid and go, you’ll need a grill that will stand up to some abuse. Look for bits and pieces that stick out and might easily be broken off, like starter buttons, handles, and gas intakes. Are the handles and legs integrated, or are they screwed on and looking like afterthoughts? Does the lid latch when it’s not in use, or will it be flapping around if it’s not sitting upright? Remember, too, that you may not always be using the grill on an ideal surface. Have a close look at the legs, and think about where the center of gravity appears to be. You don’t want to topple your grill with an aggressive spatula maneuver, or risk it flipping over if a sudden gust of wind catches your open lid like a sail. If you fall firmly into the hamburgers, hotdogs, steaks and chops crowd, you might not be as worried about cool accessories for your portable as you would be for a home grill. But if you might mix it up a little, take a look at what options the manufacturer offers. For example, some grills have interchangeable grates for different kinds of cooking. Maybe you’d like to add a skillet? Or a wok stand? If you want to expand your repertoire of dishes, check to see if your grill of choice will meet your needs before you buy. I used to sell extended warranties on consumer electronics, and I came to believe that the quality of the warranty was far more important for portable devices than for items that just sit there in your home. For that same reason, I think a good warranty is important on a portable gas grill. Read the warranty information carefully to know how long it is, what’s excluded, and what your responsibilities are as the end user. To get a feel for a company’s customer service department, check reviews on the corporate site, on Amazon, or even the Better Business Bureau website. While many people cannot be satisfied no matter what, and though more people take time to complain than compliment, you can still see if there are clear patterns of manufacturer indifference or if they really seem to try and provide assistance. The Internet is an infinitely large repository of opinions, mostly unsolicited. For consumer goods, however, this is great news; you can find out what people think of pretty much any given product without conducting your own survey. Amazon is a great place to find brutally honest reviews, usually from hundreds of consumers. While you will have to make up your own mind based on your own parameters, it’s good to know what those who have already made a choice think about their selection. So our advice, is to check out each grill on amazon and use the resource they have built for previous customer reviews. For a portable gas grill, budget is probably less of a concern than it is with a big-ticket item like a Kamado, or an outdoor kitchen. Still, it’s good to have a number in mind that you’re comfortable with. Think about how often you plan on using your new grill, and what you want out of it. How much is that worth to you? As with almost anything you buy, the cheapest product on the market is rarely a good idea, and a hefty price tag does not automatically mean high quality. Yes, it’s a small grill, and yes, it may only see seasonal use. That doesn’t mean you want something cheap and nasty that you replace every couple of years, nor should you break the bank. A quick search turns up prices from $25 to over $2000. I don’t recommend either! After consuming the above information, you should now have a good idea of what to look for in the best portable gas grills, and how to choose which would be right for you. To help, we’ve taken the liberty of choosing a few possible candidates for you and list them below, for you to take a closer look. If you don’t know the Weber brand, then you’ve probably never shopped for a barbeque before. It’s one of the best-known brands on the market, and they’ve got a reputation for quality. As far as brand reliability goes, well, Weber pretty much invented the charcoal kettle grill back in 1951. Weber produces a wide array of grills including charcoal, full-size gas, Kamado, electric, and portable gas. The Q2200 is one of four portable gas grills they offer, and is the top of the line for this category from Weber. As with all the Weber portables, the Q2200 has a single burner looped around the bottom of the cooking area. It’s powered by either a 14.1 or 16.4 oz. disposable liquid propane cylinder, and generates 12,000 BTU per hour. An electronic ignition should light you up with a single push of a button and you can adjust the heat with an infinitely variable control knob. The porcelain-coated cast iron grill (actually ‘grills’ – it divides into two sections) provides 280 sq. in. of cooking space, which is not too shabby for a portable barbeque. Weber claims you can cook 10 strip steaks simultaneously, and other sources report the ability to cook an entire chicken or roast under the tall lid. The lid has a handy thermometer built in, a feature not found on all portable grills. 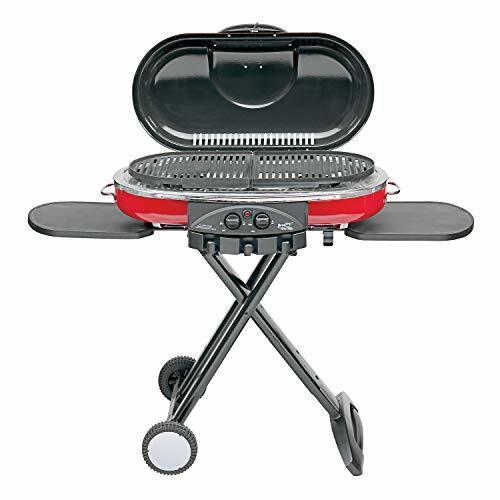 Stability is very important with a portable grill, and the design of the nylon (think solid plastic, not windbreaker jacket) legs should keep the center of gravity low and the grill stable. For additional stability, and height, you can purchase an optional cart. Speaking of options, you can add a griddle section for cooking non-grill friendly foods like pancakes, or you can use it for searing. The lid and the body are made from cast-aluminum, so heat-retention should be good, and rust minimal. Weight-wise, the Q2200 is a little chunky, coming in at 42 pounds. I’d say that’s pushing the outer limit of “portable,” but the convenient side tables do fold up and under the lid for easy storage and transport. While the Weber is a little on the large side (Weber does make smaller portables), it’s hard to argue with all that grill space. If you’re only cooking for yourself, or even just for a small family, this may be more than you need. On the other hand, if you’re big into tailgating or you like to grill while camping with the extended family, you’ll love the space and power this portable grill gives you. This grill comes recommended for those who aren’t prepared to sacrifice much in the way of cooking power and versatility when they’re away from home. Anyone with a kitchen and/or a television knows the Cuisinart brand. They’ve been making quality kitchen gadgets since their original food processor launched in 1973. Now they’ve branched out into the outdoor grill market and their offerings appear to compare favorably with the industry mainstays. 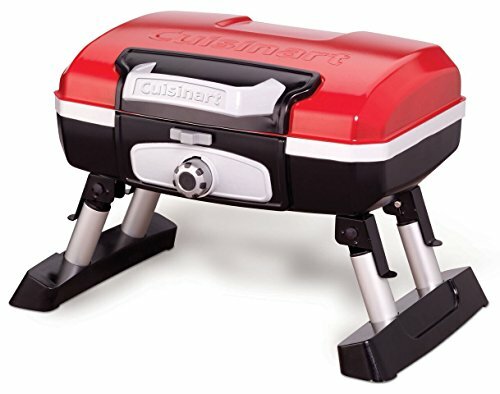 This attractive little grill looks less like a typical portable than it does a scale model of a full-size barbeque. The Stainless steel exterior finish is quite smart, and the handle runs the full width of the lid for easy use. Like the big guys, this grill has porcelain-coated cast-iron grills and a stainless steel tubular burner. The single burner covers the whole interior and should provide even heating. A twist-knob igniter sparks up 12,000 BTUs of grilling power, more than ample for all your BBQ on-the-go needs. And you can monitor the temperature with the built-in lid thermometer. There are removable side tables to the left and right for storage, and there are side handles for carrying. The attractive body is painted steel – the metal should hold up to wear and tear, but the jury is out on the paint. The clever people at Cuisinart have created an array of optional accessories to enhance your cooking experience. The grill works with the Versatile Modular Grill Surface collection of interchangeable cooking surfaces, and there’s a handy stand for when you’re leaving it on the deck. Which is where you might be tempted to leave it, by the way. It’s a nice grill and has plenty of cooking power and space. However, it’s not really optimized for portability. It weighs about 40 pounds, the lid does not latch, and the legs don’t fold up. I’m not saying you can’t take it with you, I’m just suggesting you might not want to. Overall, this has every appearance of being a good quality small barbeque, but I’d stop short of calling it a portable gas grill, despite it being marketed that way. It may be suitable for someone who wants to grill at home for a small group, and still have the freedom to go mobile on occasion. If you plan on grilling beyond your backyard frequently, in our opinion there are more portable offerings out there. If you’re an avid camper then Coleman is a name you know and trust. You might even feel a touch of nostalgia thinking back on childhood outings with drinks in the Coleman cooler, maybe some beans and wieners on the Coleman camp stove, and then reading a comic book by the light of a Coleman lantern. The traditionalists in the crowd may want a closer look at this offering from the outdoor-living industry stalwart. Your first thought when you look at this grill will probably be that it looks built to travel. Instead of being a tabletop grill, this clever number is one of few portables that come standard with its own full-height stand. Even better, it’s integrated into the BBQ. Even more better, it’s got wheels and a handle for towing. The whole design of the unit is remarkable, and it speaks to Coleman’s decades of experience making gear for outdoor enthusiasts. It’s a pretty large grill, with 285 square inches of cooking surface. You can take full advantage of all that space with a variety of optional, interchangeable cooking surfaces, and handy built-in hooks are there for you to hang your tools on while you work. There are small side tables that fold in, as well. Ok, so it’s a smart design. But, can you actually grill on it? You bet! Fire it up with the push button ignition and then turn on the burners. Yes, burners. Plural. Each burner delivers 10,000 BTU for a total of 20,000 BTU. Not only can you cook thoroughly and quickly, you can also set up separate temperature zones with just a single LP tank. The grills are porcelain-coated cast iron, and will provide even heat and long-life. Know up front, however, that the low-profile lid won’t allow for cooking anything much taller than a hamburger or some chicken legs. This is a ruggedly built grill that’s meant to travel. Having said that, it’s pretty hefty, tipping the scales at over 50 pounds. So while you won’t be taking it backpacking, the built-in wheels and handle will allow you to roll it out to the picnic spot, parking lot, cottage dock, or wherever you’re planning to cook. If you plan on cooking anything larger than the usual tailgate fare, or you want more of a combo home and away grill, this one isn’t a winner. However, if you’re likely to do a lot of game day grilling, camp cooking, or beach barbequing and you want a dedicated portable barbeque, this ingenious grill might be the right choice for you. When you’re hosting a barbeque in your backyard for friends or family, the grill is the focal point of the event. You prep and sear and grill and baste, all the while chit-chatting with guests and building anticipation for the meal to come. But when you’re grilling on the go, whether pre-game, pre-swim, or pre-campfire sing-along (if that’s your thing), time is of the essence. All you want is to grill some good food and get back to the fun! So how about a high-speed portable grill so you don’t miss your turn on “Row, Row, Row Your Boat”? Char-Broil claims to have you covered with this cool (and hot) little grill that also appears in our roundup of the best infrared grills available today. Char-Broil is a leading name in barbeque, and has been since the 1940s. They make several portable grills, including three LP gas units. So why did we choose to look at this one? Two words: infrared cooking. With infrared, the food is almost entirely separated from the open flame by a special shield built into the grill. Air and heat pass through, but the flame doesn’t. The result is supposed to be high heat that’s evenly distributed. Apparently, flare-ups are a thing of the past with this design, too. The Grill2Go is built rugged for travel, no doubt about it. Twin latches hold the lid closed, and the cast aluminum box and lid are rough and tough. The stubby legs look sturdy, as do the twin handles for carrying, and it weighs a tote-friendly 20 pounds. A push-button electric igniter brings the burner to life, which provides 9,500 BTUs. That doesn’t seem like a lot, but the infrared technology more than makes up for it by generating a ton of heat. According to some folks, it might even make too much heat. Some reviewers report burning their food on more than one occasion because they left it just a bit too long. Evidently, it’s not always easy to control the temperature, and some customers reported hitting temps of 600F and higher. Still, if speed is what you want, you shouldn’t be shutting the lid and walking away. The whole point is to grill it and go ASAP. Slightly more concerning are reports of faulty regulators when using a 20 pound tank, and clogged grates. However, Char-Broil customer service seems to be on the ball, and deal with the technical issues as they come up. All in all, the number of satisfied customers outweighs those with serious issues by a sizable margin. One of the most rugged grills on the market, the Grill2Go should stand up to anything you care to throw at it. This might not be your top pick if you want to cook delicate dishes like fish or veg, or if you enjoy taking your time at the grill. But if you just want to cook your meals fast and then rejoin your friends, this might be just the grill to toss in the back and bring along. Not every camping trip involves a big trailer, and not every tailgater actually has a vehicle with a tailgate. There are times when a guy or gal really wants to do some grilling, but it’s not practical to carry a heavy grill. Tenting trips, or even overnight canoe excursions come to mind, as do pre-game parties for folks who drive a hatchback instead of a Hummer. 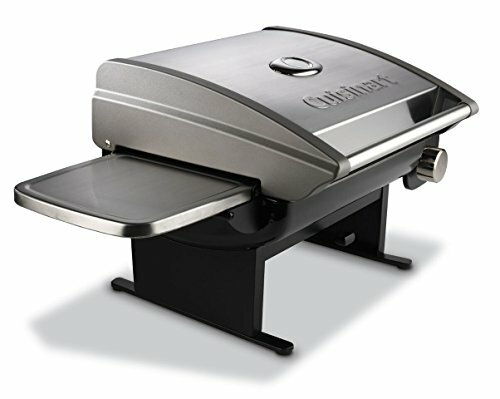 Does anyone make a truly light-weight gas grill? The masters of kitchen gadgetry have heard our pleas and they’ve responded with this diminutive portable grill. The CGG-180T is built for portability first. 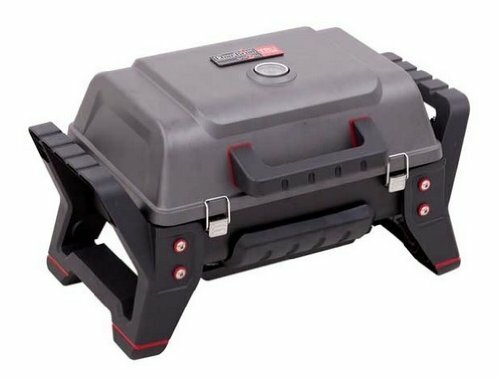 It’s equipped with folding legs that tuck neatly underneath the body of the grill, and the oversized lid handle allows you to carry it like a briefcase. Amazingly, this little cooker weighs just 13.5 pounds. Toting this one should be no problem. Actually, a fair percentage of the weight is the porcelain-coated cast iron grill. It’s nice to know they didn’t skimp on this important piece of the barbeque. Naturally, there’s limited cooking space on a unit this small. The grill gives you 145 square inches to work with. It’s not a lot, but it’s plenty to do up a few burgers, dogs, chops, steaks, or some vegetables. Cuisinart claims you can do up to 8 burgers at a time, but I think they’re talking about sliders, not big juicy patties. It’s made out of stamped steel, so don’t expect great heat retention, but honestly, that’s not why you want to buy this grill, anyway. Heat generation may be a challenge, too, with only 5,500 BTUs to cook with. Still, given the size of the grill, it should be enough for basic fare and it’s great features also make it a contender in our article searching for the best tabletop grills. Obviously there’s no way this little fellow can compete with the “big boys” of the portable grill market in terms of power or cooking space. Still, it’s a quality grill and will reward those who choose it with a barbeque meal just about anywhere they care to go. It’s perfect for campers who travel light, or picnickers who don’t want to lug a larger grill around. There you have it: 5 of the best portable gas grills, any of which could be the right one for you. Each one meets a different set of needs, and there is no one-size-fits-all solution. Having said that, I have settled on one that I feel offers the most versatility and makes the most sense for the largest segment of the portable gas grill demographic. My grill of choice from this grouping is the Coleman Road Trip. While it is kind of heavy for a portable, the amazing fold up and roll away stand more than makes up for it. You just have to love a fold up grill with dual burners, too, and the built in hooks are the kind of thoughtful touch I’ve come to expect from this company. Coleman are experts at designing and making quality outdoor living gear for people who frequently venture beyond the backyard. Anyone who buys this grill can be confident in its quality, and in the name standing behind the product. Whichever portable gas grill you choose (and if it’s not one of these, I won’t be offended), have fun out there! There’s nothing quite like a delicious meal fresh off the grill on a beautiful day out with friends or family. Got a grilling tale to tell, or a favorite product you want everyone to know about? Like friends around a campfire, we love to hear a good story! Drop us a line, or leave a comment. If you have personal experience with one of these grills, please share for the benefit of those still looking to buy. As always, we love it when you share our articles with your grill mates, or show them the way to the site. Thanks for stopping in!